Exterior decorating is often something that gets over looked around the home especially when the weathers hot. All the same the hot weather can bring very harsh conditions that can accelerate the deterioration of poor or damaged exterior paint work around the home. Paint heats and contracts massively during hot spells, leaving even more cracked and exposed wood work, leaving it increasingly more vulnerable once the Autumn and Winter sets in. 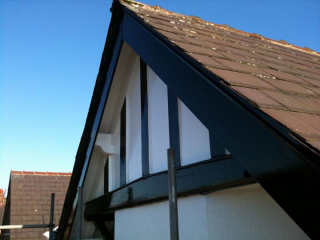 Our professionalism, experience and knowledge of exterior painting ensures you receive a top quality, hard wearing and protective finish to your external woodwork every time. No matter if it’s a front door, facias and soffits, windows or decking we can help. We use some of the the best materials with exceptional attention to detail at all times. Our team ensures everything is taken care of from start to finish, leaving your home protected and looking sparkling for years to come. At Parkinson Decorators we know the art of great painting and decorating, our results and customer recommendations stand testament to the great service we provide inside and outside the home. From Appley Bridge to Ashton, Parbold to Platt Bridge we are here to ensure you benefit from the finest painting and decorating job every time. So whilst the weather is so great, why not book your local painter and decorator, Parkinson Decorators of Wigan to take care of your home.